Wadada Leo Smith's Defiant And Fearless Elegy For Emmett Till (In 360˚ VR) Watch Wadada Leo Smith play a tribute to Emmett Till while floating down the same river where, over 60 years earlier, Till's lifeless 14-year-old body was found. Matthew Johnson, the current resident of Wadada's childhood home, gives Wadada his Mother's old bible. Wadada Leo Smith performs an elegant elegy for Emmett Till in Glendora, Miss. "You have some kind of experience that you live through and have to make something out of," he says. "The good and the bad is all put into the music. It's me." Then he steps into a canoe, trumpet in hand, and begins to play an improvised musical elegy for Emmett Till based on a passage from his own composition "Emmett Till: Defiant, Fearless" — while floating down the same river where Till's 14-year-old lifeless body was found. His murder was the result of a racist hate crime not uncommon in the Jim Crow South. Till had allegedly cat-called a white woman (an accusation later proven false) and was subsequently tracked down, beaten, shot in the head and dumped into a nearby river. He was African-American; his murderers were white. When Till's body was recovered a few days later, his mother required that his casket remain open, an act that became a rallying cry for the Civil Rights movement. But for Smith, this story is more personal. Born on Dec. 18, 1941, Smith grew up in Leland, Miss.. He was 14, nearly the same age as Till. And as a young black man in the South, Smith remembers the event well. "Everyone was actually very fearful to go long distances alone," he recalled. Smith got into music first through his stepfather, a local Delta blues guitarist known as Lil' Bill Wallace. Wadada switched from blues to jazz after high school, and from jazz to "creative music" — a genre-less brand of free improvisation and free thinking that came out of the Chicago-based collective the Association for the Advancement of Creative Musicians (AACM), of which Smith was an integral part in the 1970s. His music has always been thoughtful, challenging and often political. He wrote "Emmett Till: Defiant, Fearless" in 2012 for his album Ten Freedom Summers, about key figures and moments in the civil rights movement. That album received a nomination for the Pulitzer Prize — the first in a string of high-profile, late-career accolades for Smith. He is on the cover of the current DownBeat magazine, and was named 2017 Jazz Artist of the Year by the Jazz Journalist Association. The New York Times named his most recent album, America's National Parks, one of the year's best in 2016. 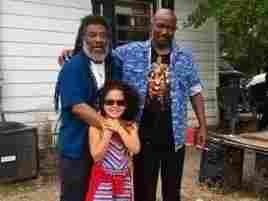 Jaya, Kashala and Wadada Leo Smith with Oneal Jones. The whole scene was serene and a bit surreal for Kashala and Jaya, who had started the day in New Haven, Conn., where they live just a few minutes down the road from Wadada. The performance kicked off a kind of weekend-long homecoming for Smith, who hadn't been back in over a decade, and a hometown tour for Jaya, who had never been to the South. 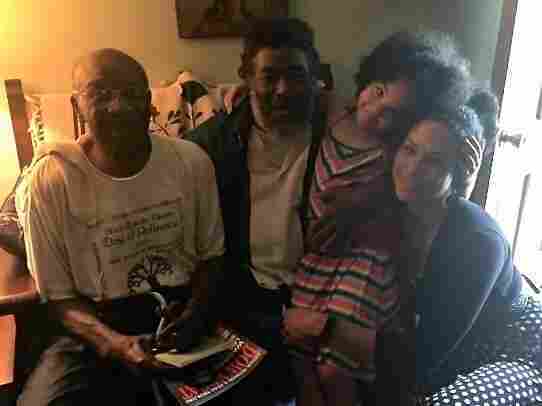 Wadada visits the home of the 90 year-old Oneal Jones, his high school music teacher. Wadada meets his distant cousin for the first time. There's an open warmth to Smith that seemed to invite these kind of encounters, but it also jibed with the character of the people around town. When Smith dropped by his childhood home, for instance, he just knocked on the door and the current owner, Matthew Johnson, invited everyone right in, toured us around and eventually retrieved Smith's mother's old bible, which he'd held onto all these years. It turned out the Bible doubled as a baby book; as they flipped through, Kashala found her own birth announcement. Kashala was raised in New Haven, Conn., and hadn't been to her dad's hometown since she was a kid. She said coming back as an adult with her own daughter was an emotional experience. It was strange and sad to think of her father's life here in the deep South, and how elements of that history are still affecting her six-year-old in the Northeast. "You grow up and you know that the South is different," she said. "But then you realize that this is Jim Crow South. And you think it's this bad now, so what in the world was it like for my Dad?" "This is why I came," Kashala said, with a shake in her voice. "Because I wanted to experience it as an adult, now that I know what the world is like. And I'll never forget this." Smith describes the thinking behind his Emmett Till piece like this: "The concept is, where life is, death is not." It's a subtle yet powerful shift in perspective that carried from the performance through the weekend-long trip, that brought three generations of his own family back to this place. "I'd really like to wake up Emmett," Wadada reflected, after the performance, "I played the trumpet like that to try to make it almost like a signal of something, an alarm to wake up or something. You know. That's kind of how I feel." On this day, the 62nd anniversary of Till's death, the hope would be that this horrific event was a sobering yet distant reality. But on the bank of the Little Tallahatchie, the cry of solo trumpet in the air, that reality feels far less distant. The music and the message is hopeful but urgent.